Tuesday we had the guys come in and the first thing they did was knock all the remaining trees down. I think everyone enjoyed doing that, although at the end it did look a little sad. We had 78 trees left on the lot and needed to push them down and remove the stands and wash the bowls. 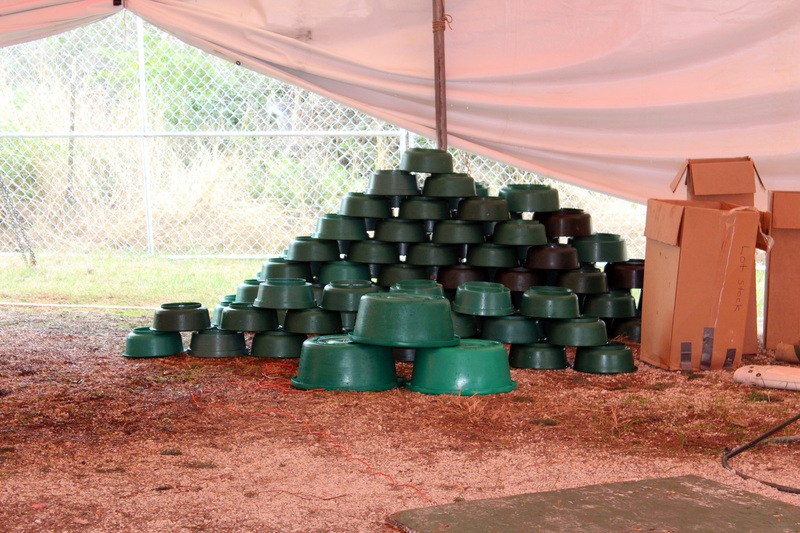 A stack of bowls drying before they go back in their boxes. The tear down process is actually pretty complicated. I had three different ending inventory sheets and everything was counted and put in separate piles. 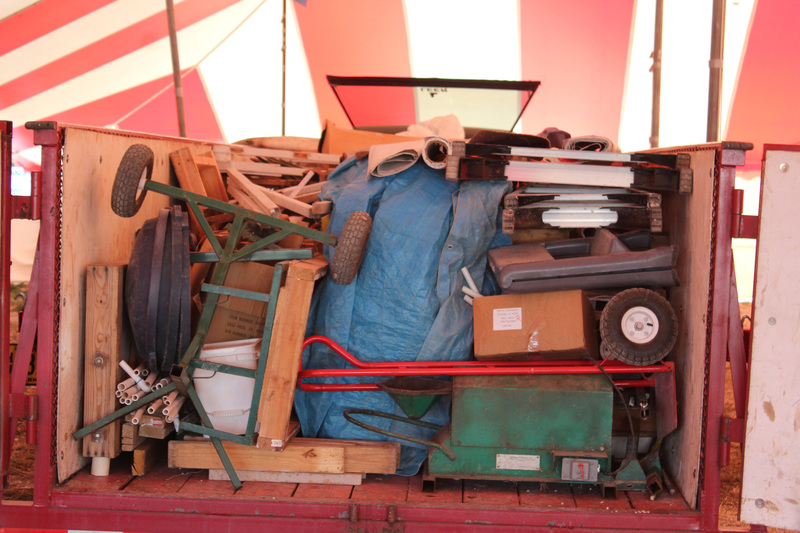 Some items for our trailer at the end (tarps, signs, stands, bowls, office supplies) and everything is carefully counted and inventoried. 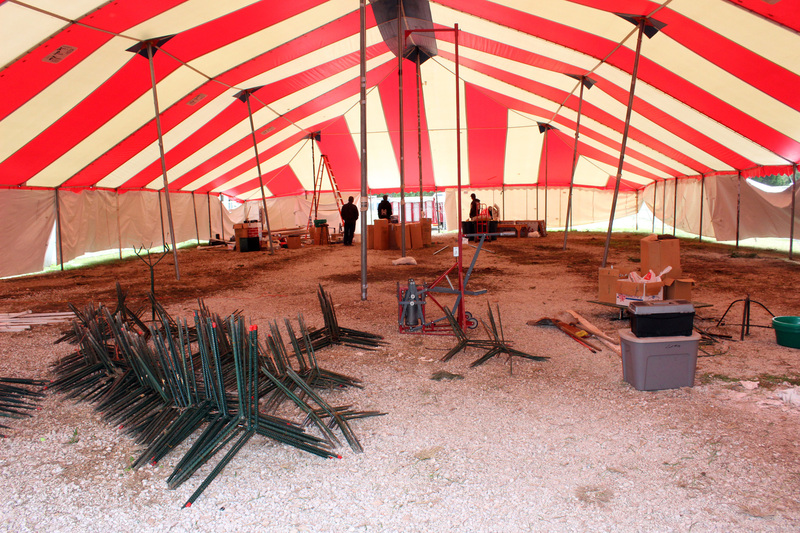 Each tent has a “kit” with a prescribed number of items and the extras or items that are damaged are removed and placed into a different pile. Just doing my office supply box took a couple of hours as I had a three page checklist I had to check off. It makes sense, because then next year everyone will have a complete box, but it was time consuming. 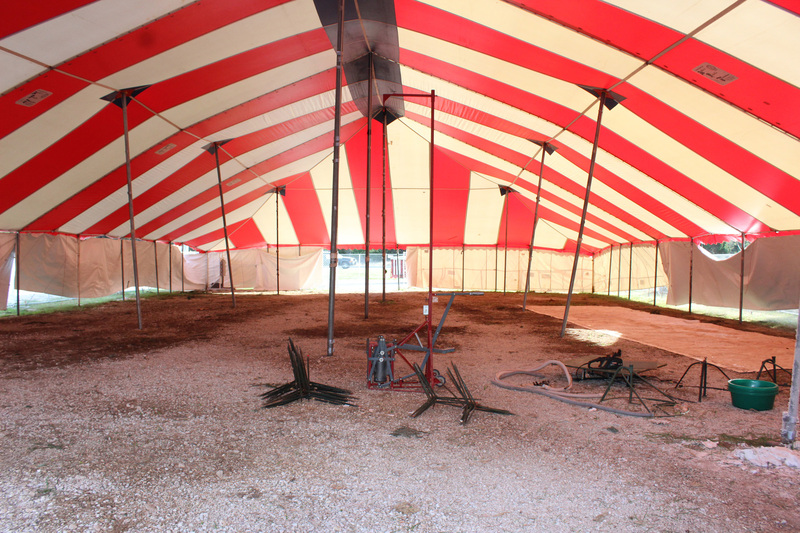 While the guys did the stands and bowls and Lee took down all the electrical lines, I counted and made separate piles. 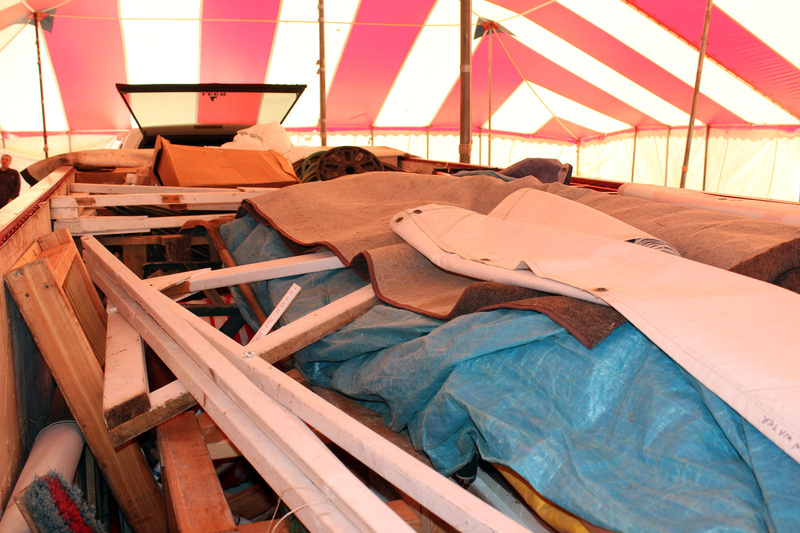 Most of the excess new inventory goes back to the warehouse to be redistributed, but some items (like floor covers) stay in the trailer. I also was missing one inventory sheet that included how many trees we had left, but thankfully called Greg with a question and found out I was missing something. The guys pulled all the tags from the downed trees and then we did one last inventory. The owner called and said he thought the trees would be picked up the next day and we were also told the trailer for all of our equipment and inventory would be arriving Wednesday or Thursday. That was OK though, because we had plenty to do. The four of us worked 9am- 2pm and made pretty good progress. 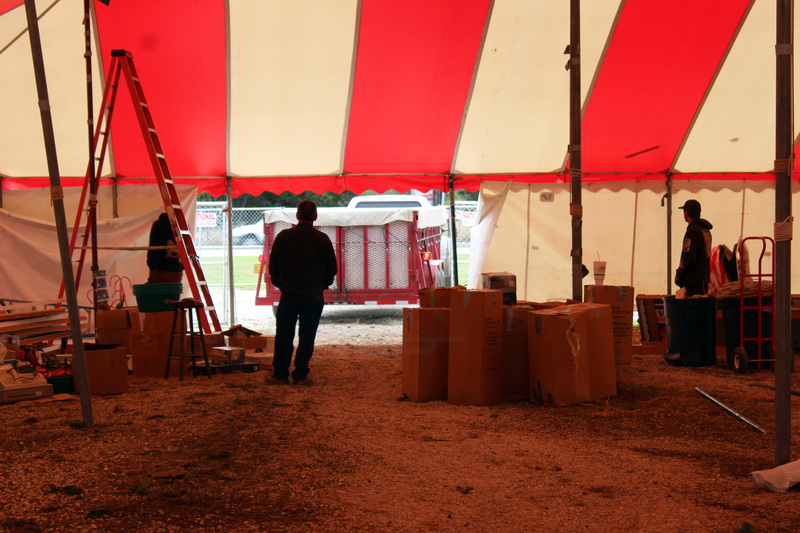 My booth was disassembled, signs were taken down, and two nice sized piles (one for trailer and one for warehouse) had been formed by the end of that time. It was incredibly muggy though. It didn’t rain again, but it was 80 degrees and pretty soupy. Lee had the worst of it as he was outside taking down the electrical and his shirt was drenched by the time he was done. This is where his live event experience was a huge plus though as he has tons of experience “striking” an event. I unfortunately found a tree tally sheet that I had totally spaced on earlier in the year. I had to go back to December 1st and hand write in all the trees (by size and type) we had sold per day. The company is in the process of going paperless, but in the meantime there is some double entry, but the exercise was sort of interesting as I got a bird’s eye view of our sales. 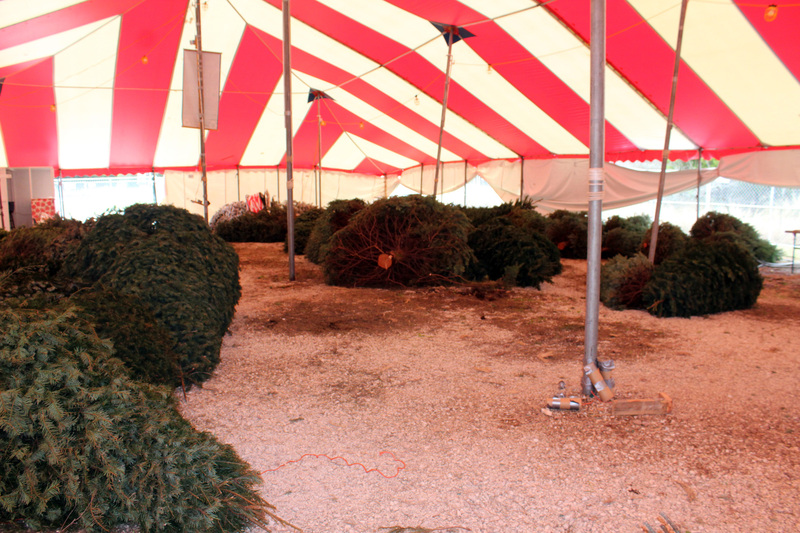 Of the trees we sold 45 (or a little under 10%) were 9 feet or larger. We sold the first big one November 23rd and the last December 21. Why that matters is because of labor. We were originally given a rough estimate of $2700 in labor for the lot but completely blew that, spending $4550. 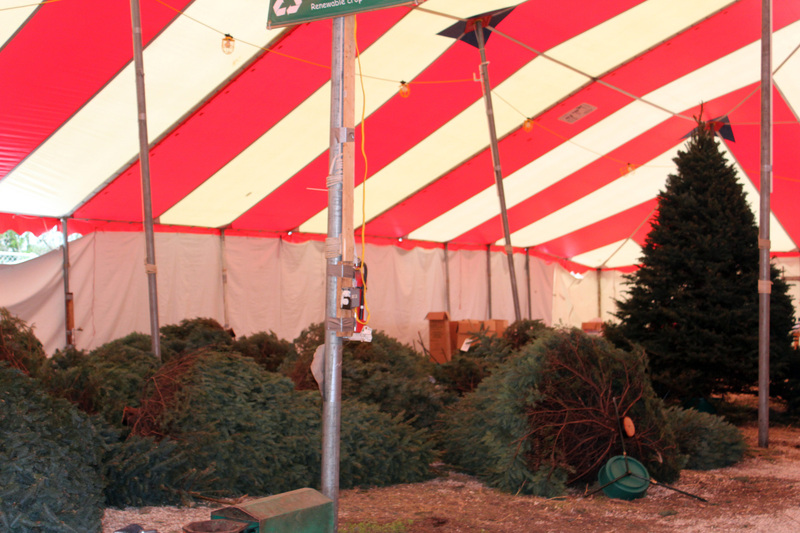 This is a huge discrepancy and is mainly due to needing a second guy to help with the big tree sales. Since those sales were spread throughout multiple days we never knew when a big tree sale would come and I simply couldn’t help lift anything larger than an 8 footer. I also took a look at our gross sales. Unfortunately I had no idea what the benchmarks are for sales versus trees. I also have no idea of expected costs. But I am preparing myself, the best I can, for the bonus conversation. Plus as you know I am a data junkie, and I found it all pretty interesting. Wednesday we just waited. When the city came and took our trashcan (somewhat unexpectedly) I did call and ask what we were supposed to do with the remaining trash and was told to put it in trash bags and haul it out. I asked at that point if we were on the schedule yet for picking up our leftover trees, and packing up our trailer, and was told we were bumped because the tent company wanted to take the tent down in another location. They thought it would be Thursday. No word yet on when the guys would be coming to pick up the trees (I had originally heard maybe Tuesday) so we just waited. I went and did laundry (sheets, blankets, etc) and Lee organized our desk area and then in the afternoon we started looking at summer work kamping jobs. We had applied for a job in Oregon (and have an interview scheduled next week), but felt this was a good time to really dig in. We use Work Kamper News primarily for camp host jobs and I look at their job hotline emails almost every day, but once every two months they put out an online newsletter and that has a more comprehensive list. My friend Kelly is an absolute whiz at finding these jobs, but I find the whole process pretty daunting. There are tons of ads and unless you know specifically where you want to be, no good way of sorting through them. Ultimately we printed out the newsletter, read them all, and then circled ones we were interested in. Since not all the ads are clear on the hourly wage or the amount of hours worked, followup is usually called for. That’s the part that is super time consuming, so I like to narrow things down quite a bit before contacting the employer. That involves looking at their web page, checking out their location on google earth, seeing what cities/attractions are nearby, and looking to see if they have ATT coverage. The process is somewhat similar to campground searches, but since you will be staying there an entire summer more detailed research is required. Since we found about 15 ads we were interested in though that was a ton of research, so Lee wanted to take another approach. He is planning on writing a somewhat generic email with our resume attached and then sending it to the employers to try to get a little more information. For us, there are three main factors in how we choose a camp host job and they are location, type of work/schedule, and wages paid. Depending on the desirability of one of those three things we are willing to have less in another area. That being said we need certain things in each category to make it work. We need to get paid, we need to work 32-40 hours a week, we need tolerable weather, we need some type of cell coverage, and the job has to be somewhat interesting to us. I’m not willing to work 40 hours a week just cleaning for example. 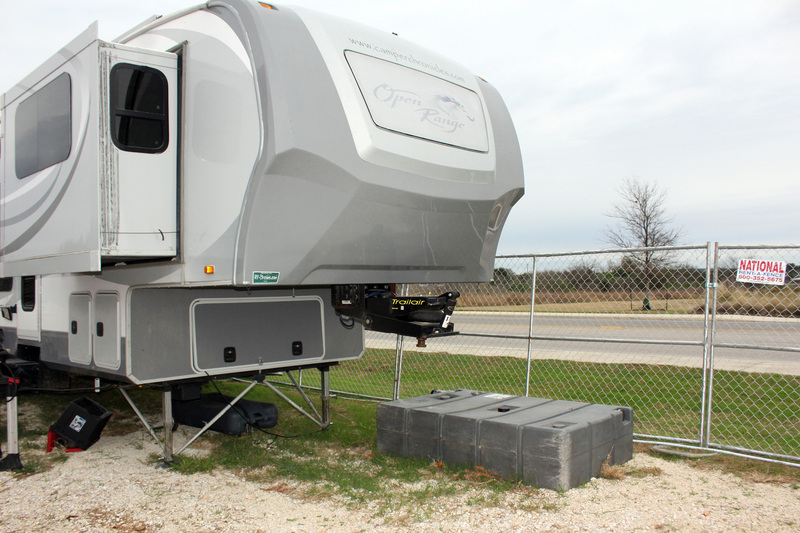 Just finding a job with our minimums is harder than you would think, and since Work Kamper News is for all types of RVers who want all types of jobs, we have to narrow it down. It’s actually easier when we need a particular location (like when we were looking in Alaska), but this year it is somewhat wide open for us. Anyway, it’s a process, and we’ve started it. 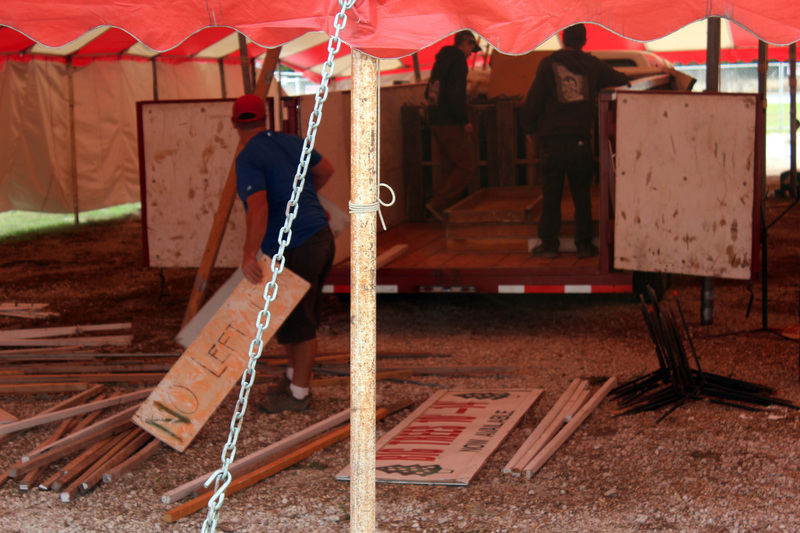 Thursday morning we got the call that the trailer was coming so we called in our two remaining employees to work. About 20 minutes after the trailer came, the people just showed up without warning to pick up the trees. Now at first glance this might make sense, but we couldn’t simultaneously load the trailer and get the trees out of the lot, so one thing would have to wait for the other. At least it was all happening on Thursday. We finished up the little bit that was left and verified the ending inventory then I sent the employees on a half hour lunch break. It took over two hours for the trees to be loaded, but they finally got it done, and at least we didn’t have to lift, carry, or load them. Then we pulled our trailer in and set to work. It took 5 hours for 6 of us to load the trailer and truck and then clean the lot, but a lot of that time was figuring out the jigsaw puzzle of the trailer. In order to make everything fit each piece went in a certain way, but at the end it was all loaded. Lee had a good time, he said strike is his favorite part of every show. Friday morning they came with a different trailer and picked up what was left. They also took down the electrical panel, but we still have power and water from a separate source. So everything was checked out and we were ready to leave, except…no. 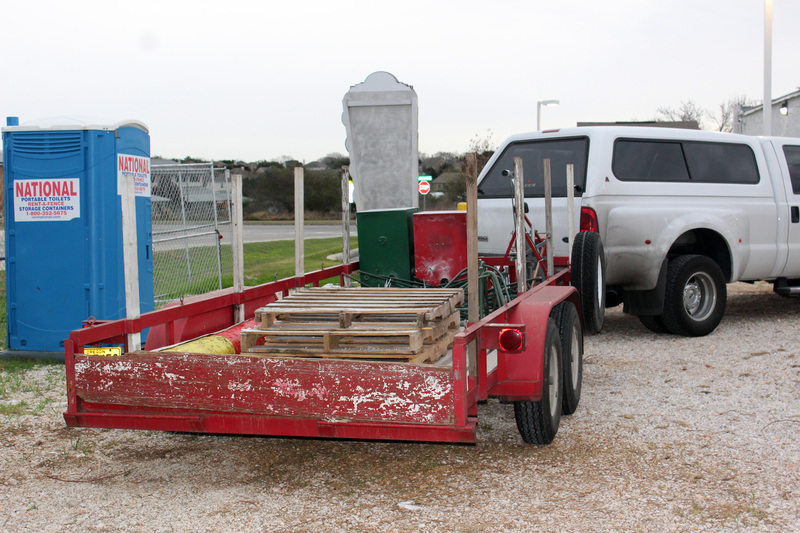 We were told the port-a john and wastewater tank were getting picked up on Wednesday of the week, but the owner extended the service another week so people could stay longer. Problem was we were never told, and now we are blocked in. Our tank was originally supposed to go behind our trailer, but there was no room to get it back there so it went in the front. It’s completely full, (since we thought it was being picked up we did a last flush of our tanks) and where it is located blocks our ability to hitch up the truck. It’s hard to tell from the pic, but there is no way to back in the truck and hitch because of where the tank is located. It can’t be moved (weighs about 1K full) and no room to hitch. 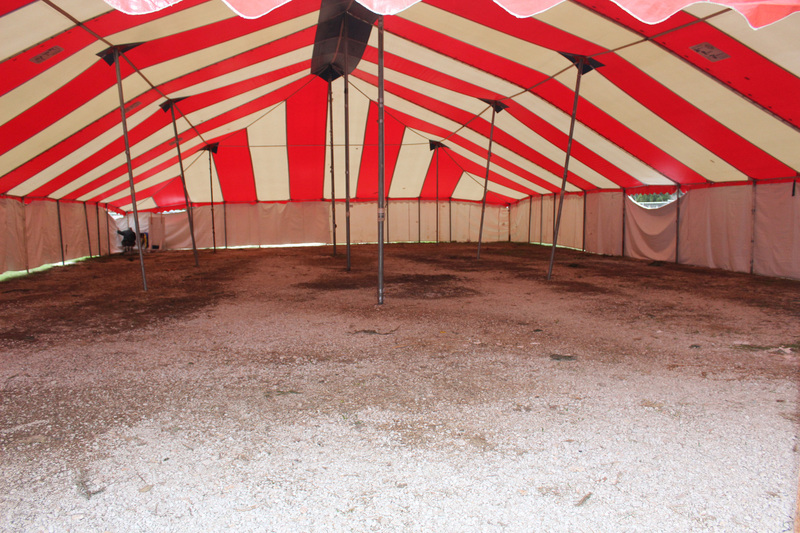 Even if we could hitch, the tent is so close that we couldn’t easily maneuver out. Needless to say I was not happy. We made an appointment to get our axle looked at on Monday morning and had plans to start heading to Quartszite. The timing of all that was tricky enough since we can’t stay at the Camping World location and we were dealing with a holiday weekend. Lee called the owner who said to call the company and see if they could do a supplemental pump out (Lee thinks he could move it out of the way empty) but they said they were nowhere in the area and they were closed Saturday – Monday for the holiday. At this point I was really starting to feel trapped and that was NOT a good feeling. Lee though was oddly fine with it. For him we had a free place to stay until January 4th, he could move the repair appointment to later in the week, and we wouldn’t have to deal with the holiday. It would give us time to take care of more housekeeping items including my end of year financial review, which always takes a while. We would have time to explore the area, which we have had no time to do prior to now. And possibly most importantly to him it will be much easier to get the rig out once the tent and fence are down which should be happening Tuesday and Thursday respectively. I saw his point but still wasn’t crazy about it. And then the sewer company just showed up. They were pretty clear to Lee it wasn’t going to happen, but they must have changed their mind. We talked about it and Lee still wanted to stay the few extra days and I was totally fine with that. Now it’s a choice, which makes it totally OK for me. Happy New Year❤💕🎉 WELL DONE! I so could have helped with strike and load-out. Like Lee says, it is the best part of the show because you are DONE. I totally identify with your feelings of being trapped by the tank. If it is a choice to stay it is one thing, but to be pinned down and unable to move would make me really antsy. Thanks Ted…that’s exactly how I felt!! I have read the descriptions of your work everytime you have posted & it seems exhausting. 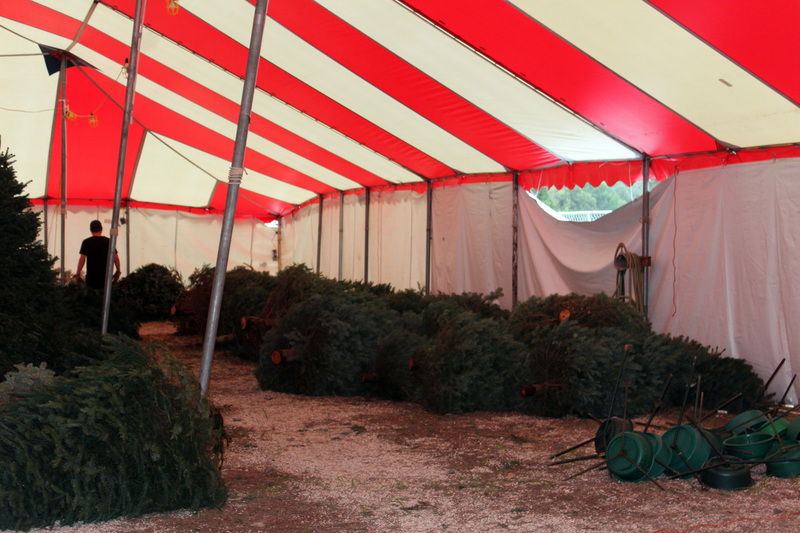 I admit to having a new appreciation for workers at a Christmas Tree lot! Happy New Year to you both. Right now we are on the fence and yes it absolutely depends on how the bonus conversation goes. We made things harder than they had to be with our inexperience in the beginning and whether we get any pushback on the labor costs will be a huge factor. If they are holding us strictly to he low labor rates then we just can’t do this. Lee can’t do that much physical labor. If the labor was a guideline and they take care of us, we would absolutely do it again. Will just have to see. It makes me a bit sad to see all those trees laying on the ground! They are so beautiful and being wasted! Oh well! You know I’m right there with you with the feeling of being trapped – that would NOT have worked for me at all! Glad that was resolved! Happy New Year!